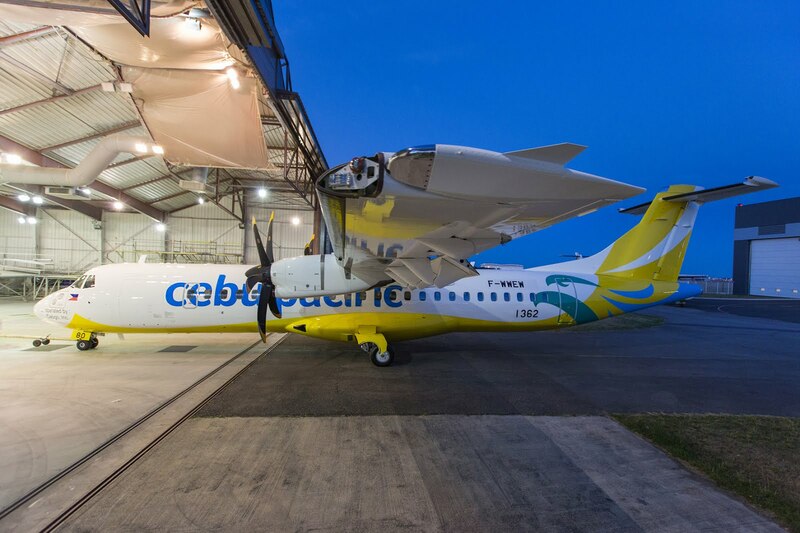 Aviation Updates Philippines - The Philippines' leading carrier, Cebu Pacific Air (PSE: CEB), yesterday took delivery of the very first ATR 72-600 High Capacity aircraft at an event in Toulouse, France. The delivery is the first of a US$673-million order of 16 aircraft that was placed at the 2015 Paris Airshow, which also includes an option to acquire additional 10 more planes. Cebu Pacific's new ATR 72-600 also sporting the new colors. Photo by ATR. The new ATR 72-600 which will be operated by Cebgo, the wholly owned subsidiary of CEB, features advanced avionics, enhanced performance in hot and high environments and increased cabin space along with additional seating capacity. The additional seating capacity will help further lower unit seat costs enabling CEB to pass on the benefits through lower fares to its customers. CEB will progressively replace its current fleet of eight ATR 72-500s – which are configured with 72 seats – with the fleet of 16 new ATR 72-600s, with 78 seats. Deliveries of the ATR 72-600s will run until 2020. The airline is modernizing its fleet with the most popular regional aircraft to substantially expand its route network and frequencies across the archipelago and continue to support the growing Philippine economy. In a particularly competitive environment, the new high capacity ATR 72-600s will help the airline reduce its fleet's fuel consumption and cost per seat while answering the growing demand for inter-island connectivity. Commenting on this major delivery, Lance Gokongwei, President and CEO of Cebu Pacific Air declared: "We are honored to be the launch operator of the largest-capacity configuration of the ATR 72-600. These aircraft will enable us to provide the most modern standards of comfort and even more competitive fares to our guests, while expanding our inter-island network. The opening of new routes and destinations will help strengthen links between local communities and encourage more business and tourism opportunities. The Required Navigation Performance-Authorization Required (RNP AR) and Vertical Navigation (VNAV) capability of our new ATR 72-600 fleet will further increase airfield access, benefiting the economies of remote provinces, as well as facilitating more efficient air traffic management." Patrick de Castelbajac, Chief Executive Officer of ATR, commented: "The ATR 72-600 is particularly successful in South East Asia as it offers the optimal answer for regional travel, in terms of both operating costs and passenger experience. The new high capacity option is particularly adapted to the operational needs of a successful low-cost carrier in this part of the world. We look forward to see our first 78-seater fly with one of the fastest-growing carriers, Cebu Pacific. " ATR has some 380 aircraft operating in Asia-Pacific in the liveries of over 60 airlines. In recent years, Asia-Pacific has become the world region with the largest number of ATR aircraft in operation. ATR estimates demand for some 750 turboprops in this region within the next two decades. CEB offers flights to 36 domestic and 30 international destinations, covering an extensive network that spans Asia, Australia, and the Middle East. Its 56-strong fleet is comprised of six Airbus A319, 36 Airbus A320, six Airbus A330, and eight ATR 72-500 aircraft. Between 2016 and 2021, CEB expects delivery of 32 Airbus A321neo, two Airbus A330, and 16 ATR 72-600 aircraft.